With just four days remaining until the curtain is drawn on “UFC 142: Aldo vs. Mendes,” the Ultimate Fighting Championship has revealed the official agenda for Saturday’s event in Brazil. As expected, FX will broadcast four preliminary bouts beginning at 8PM ET/5PM PT. The two-hour show marks the network’s first foray into the live world of mixed martial arts. Prior to the freebie fights on FX, the UFC’s Facebook page will stream the featherweight affair between Felipe Arantes and Antonio Carvalho at approximately 7PM ET/4PM PT. The pay-per-view broadcast airs live at 10PM ET/7PM PT. 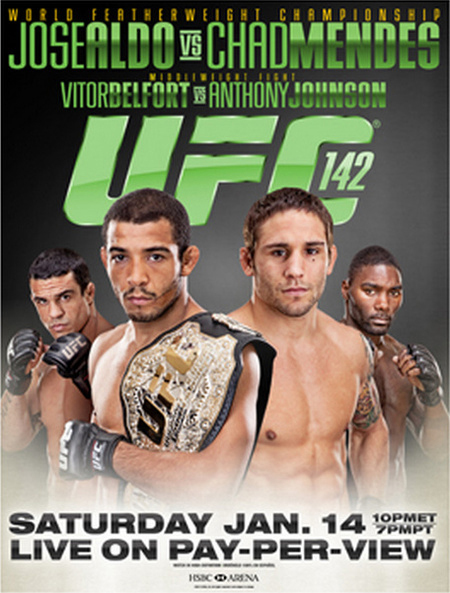 Jose Aldo defends his 145-pound crown against Chad Mendes in the night’s featured attraction. The HSBC Arena in Rio de Jenairo hosts the festivities.